June 3, 2017 – Community Yard Sale – The first Saturday in June, 8:00 a.m. to 2:00 p.m., rain or shine. August 22, 2017 – Annual Meeting at Hope Lutheran Church, 7:00 p.m.
October 7, 2017 – Community Yard Sale – The first Saturday in October, 8:00 a.m. to 2:00 p.m., rain or shine. New Facebook Page: Check out our new Facebook page at facebook.com/bhhca. 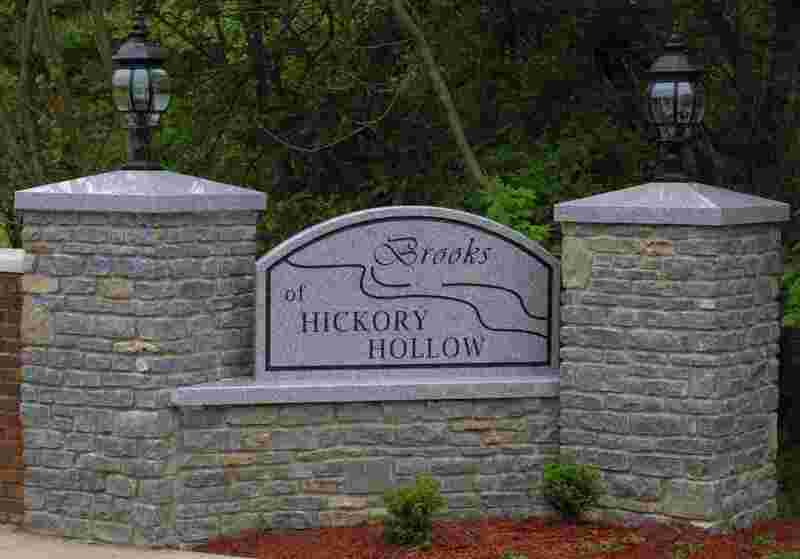 us to stay informed on the latest news in the Brooks of Hickory Hollow. Crime Update: There were several car break-ins in our area over the winter. Valuables were taken and a couple of cars were stolen. Please remove valuables, lock your vehicles, turn on outside lights, and report suspicious activity to LMPD non-emergency at 502-574-7111. For emergencies call 911. Sidewalk Handicap Ramps: Wonder why there was work being done to some sidewalks? Louisville Metro is required to put in handicap ramps on sidewalks prior to any new paving and Shenandoah Drive is scheduled to be repaved. Annual Dues: 2017 annual dues are $140. Pay by April 30th to be entered in the prize drawing! See enclosed invoice for details and the discount for paying early. See Details HERE. Ø No parking on the street or grass. Street parking is for temporary guests IF there is no room in your driveway. Ø Please don’t block the sidewalks. It is an inconvenience to walkers and violates Jefferson County ordinance. Ø No boats, trailers, campers, motor homes, commercial vehicles, semi-trucks, jet skis, etc. are allowed in our community unless kept in a closed garage. Ø Mow and edge on a regular basis. Don’t throw yard waste in the creek, ditches, or street. Ø Pick up after your pets and properly dispose of the waste. It’s the law! Trash Cans: Trash cans must be stored where they are not visible from the street. This means in your garage, storage shed, backyard, etc. Please help keep our community looking neat and attractive by properly storing trash cans. Curb appeal does make a difference in property values. Trash Service: New homeowners can contact Republic Services at 502-638-9000 to get our special community rates. Who do I contact for questions, complaints, or concerns? Email the Board of Directors at AskTheBoard@bhhca.org and provide the property address and specific details. I’m selling my home. How does the closing agent verify my dues are paid? Call Ken Wheat at 502-552-1219. How can I get a street light repaired? Call LG&E at 589-1444. They will need the address of the home closest to the light. We pay a flat rate per light whether the light works or not and repairs are included. Any homeowner can request a repair. Where is a copy of the community rules/restrictions? The Declaration of Covenants, Conditions, and Restrictions is on the website at www.bhhca.org under “Bylaws and Declarations”. They are also recorded in the public records of Jefferson County. Info & Updates: Check out our website and Facebook page listed above. “Like” us on Facebook to stay informed of the latest news. We also email more urgent info, so make sure we have your current email address. Trash Cans: (UPDATE 2016) We have received several complaints about trash cans being stored in front of or next to garages, sometimes overflowing with trash. This hurts curb appeal and is a violation of the community restrictions. Trash cans must be stored where they are not visible from the street. This means in your garage, storage shed, backyard, etc. We are asking for everyone’s cooperation. Going forward, individual homeowners will be cited for violations if the Board receives complaints. Have a question, complaint, or concern? Email the Board at AskTheBoard@bhhca.org and provide the address and specific details. Are you selling your home and the closing agent needs to verify dues are paid? Call Ken Wheat at 502-552-1219. What do annual dues pay for? Street lights, snow removal, administrative costs, repairs/maintenance of the front entrance, signs, landscaping, yard sale ad, website, P.O. Box, community social, etc. Where can I get more information? Here on the website at www.bhhca.org, or email us at AskTheBoard@bhhca.org. Basketball Goals: Permanently installed basketball goals require written approval of the Board of Directors. Non-permanent/portable basketball goals are not allowed. Making A Complaint: Board Members don’t patrol the neighborhood looking for violations. We rely on homeowners to report violations because those living nearby are in the best position to know if a violation is ongoing or a temporary situation. Please provide the address and specific details when making a complaint. All complaints are kept confidential. If you receive a violation letter, it means the board received a complaint from a homeowner. You can email the board at AskTheBoard@bhhca.org. Please contact Louisville Metro Call at 311 or www.louisvilleky.gov/MetroCall or LMPD at 574-2111 for enforcement. They may issue citations, fines and/or have work done to correct these violations at the homeowner’s expense. o Discourage children/teens from loitering at the front entrance. All vandalism is reported to LMPD. o Don’t leave valuables visible in cars. o Lock cars and remove garage door openers if the vehicle is outside the garage. o Keep overhead garage doors closed when you are not in the garage. o Lock all doors and windows. o Turn outside lights on at night. o Always report crime and/or suspicious activity to the police. They track all activity and assign police in areas as needed. Louisville Metro Police Department’s (LMPD) non-emergency number is 574-2111.